The annual release of the Call of Duty series has forcefully wedged itself into a position of volatility with fans. Much like religion or politics, speaking of COD, whether for it or against it, is sure to illicit passionate responses. Most against the yearly release will gleefully point out that the experience is largely the same year after year. Fans though, simply cite the monstrous sales figures as proof that there’s COD, then there’s everyone else. This year though, developer Treyarch has implemented enough changes into the release of Black Ops 2 multiplayer that it deserves to be acknowledged on its own. Truly, the COD series can be simplified (and often is) as games where “you just run around shooting people” by those who either don’t understand or refuse to acknowledge the required team tactics that are needed to emerge as the victor. Every player has a role, whether you’re the player using low kill streaks and playing defensively or you’re the slayer, sitting in the thick of battle and facing multiple foes by yourself consistently. Because of that, a new class system has been introduced that allows players to customize each class specifically to their own play style. Don’t use secondary grenades? Fine, don’t equip them. That frees you up to equip other bonuses like multiple lethal grenades or additional gun attachments. With the 10 points you’re allotted, players can create millions of different options using multiple guns, perks, and equipment. Also gone are the typical kill streaks we’ve become accustomed to, now replaced with score streaks instead. Rather than using kill after kill to unleash your UAV, attack chopper, or even dogs (yes, they’re back), players build toward those rewards by scoring points consecutively. Sure, kills yield a large amount of points, but now players are more apt to play toward objectives rather than camping in the back of a map and sniping at every opportunity. Speaking of maps, Treyarch has done a wonderful job creating environments that mimic those found in single player, but also allow for multiple play styles to emerge. Gone are the days when players see maps designed specifically for sniping or SMG’s; instead players find ample opportunity for various weapons at specific points on each and every map. 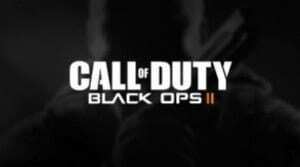 Not only has Call of Duty evolved its play style, but the release of Black Ops 2 shows that the maps themselves have been given designed specifically for all players. It may be those maps that create some of the issues apparent in this release, though. The spawn system consistently places players in the crosshairs (sometimes literally) of the enemy. Even in matches where spawning would be allowed more freedom, Kill Confirmed or Deathmatch for instance, players are inexplicably spawned in the midst of the enemy’s presence. Players may die within seconds of spawning four, five, or six times before the game recognizes that the spawn point should be moved or that the player should be spawning with his or her own team, rather than with the enemy. It creates a volatile and often lopsided conclusion to each match. The other major issue – another not entirely in the player’s control – is the game connection and the player being forced to rely on it for survivability. An issue that didn’t seem to crop up until last year’s installment Modern Warfare 3, the dreaded ‘3-bar connection’ affects hit detection and player lag. In the original Black Ops, a 3-bar connection (on a scale of 4) wasn’t the end of the world and still allowed players to maintain a high level of play. This time around, without peaking with a 4-bar connection you’ll face a severe disadvantage. Thankfully, these two major issues are able to be fixed by future patches, the question though is: will it be? The removal of ‘pro perks’ and contracts is also something to be noted. Whereas Black Ops gave players something additional to work towards, minor goals and different objectives to complete, the sequel has nothing even comparable to that. That absence makes players feel like the only worthwhile objectives in the game are ranking up and winning each individual match. The loss of those meta-games, progression systems built within the original framework to give players additional objectives, seems like a rare miss in this series. Another returning treat is the lauded Zombies Mode, although it has undergone some definitive changes as well. Now running on the multiplayer engine, it now comes in four flavors: TranZit, Grief, Survival, and Custom mode. TranZit is similar to Survival, in that the gameplay is what players will remember from previous installments, battling wave after wave of the undead. TranZit though, will allow players to move from area to area with particular objectives to be completed at each transit stop. Grief may well be the biggest change, pitting two teams of four against the zombies and indirectly causing competition to unfold between the two teams. You can’t kill or revive the enemy team members, but the zombies will attack either of you without regard to loyalties. Truly, the new twists and additional flavors to an add-on that was fast becoming stale is a welcomed sight and one that will cause players to return again and again. Surely, Call of Duty Black Ops II is an amalgamation of “same but different” with its unique class framework melded with the recognizable gameplay of previous titles. It’s a wonderful installment and meets the requirements that fans wanted with Black Ops 2, though it has a few issues that need to be ironed out to be considered one of the greats. The guns feel wonderful and the level progression is a fantastic pace, but the series has taken a step back after removing the contract system and the pro-level perks introduced in the original. Despite that, fans of shooters will be hard-pressed to find a better one in 2012. In the age of electronic communications, birthday wishes can easily be shipped electronically. Playing cards can be sent electronically, or greetings can be despatched by way of e-mail, textual content messages or updates on social networks.